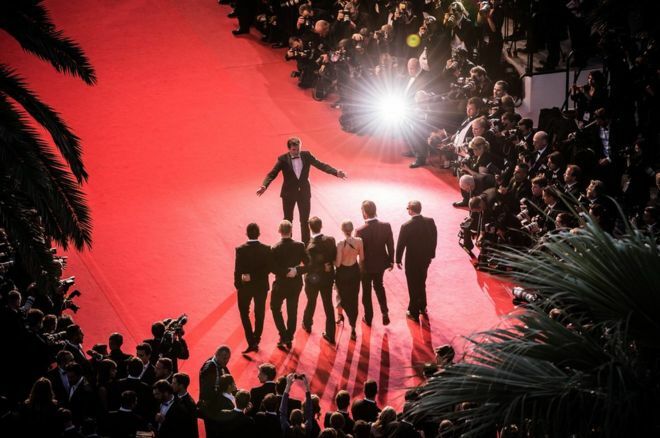 To mark the 70th anniversary of the Cannes Film Festival, Lisa-Marie Rae, a photo editor at Getty Images, picks out some of her favourite moments. Julia Roberts has always been a red-carpet rebel - from fuzzy armpits to nonchalantly walking barefoot in protest against the strict red carpet guidelines for women that state they must wear high heels. Her grin says it all. It is these unplanned acts of defiance, no matter how small, that really make headlines. Aged 18, Brigitte Bardot wore a bikini to the beach and caused quite the stir. 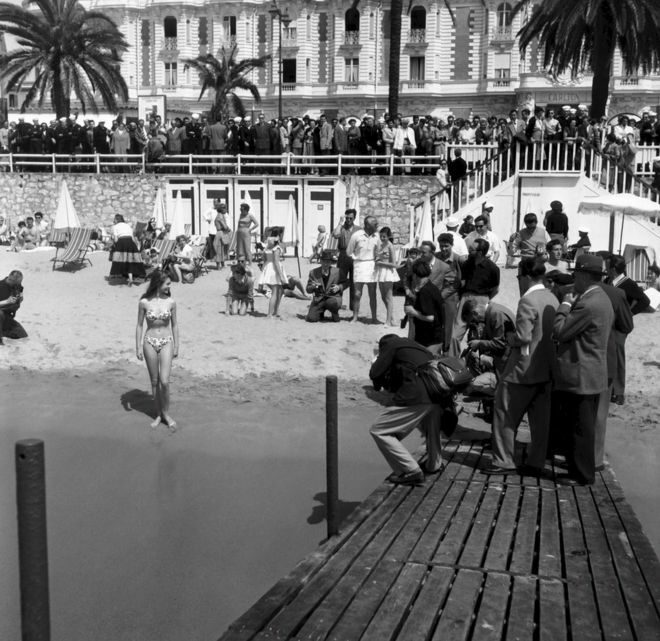 Here, she is posing for the press, oblivious to the growing crowd on the Croisette [a seafront road in Cannes] looking down at her. It is fair to say that she made the bikini fashionable. I never thought I would see an Adidas tracksuit at the Cannes Film Festival, but trust the Spice Girls to make it a first. This image challenges the glamorous norm of the festival with its strict dress codes for the red carpet and adds a little spice to the proceedings. For me, this image captures all the glamour and fun of the American Foundation for Aids Research fundraiser, which is my favourite event of the festival. The power of celebrity is used annually to raise millions of euros for charity, and everyone who attends is dressed to impress. The power couple "Brangelina" were (sad face) always beautiful to photograph, and this is a great example of their chemistry on the red carpet. Brad Pitt always stepped aside so we could get our solo shots of Angelina Jolie for the fashion press, who are always vying to see which brands have dressed her. This is a beautifully caught moment that makes them appear to be in the middle of a dance, and the brightness of the red carpet, the camera flashes and green palms in the background just add to the beauty of the image. The festival is all about films, but fashion plays a huge part, and I am always excited to see who chooses to be daring and fashion forward and who plays it safe. When Madonna attended the festival to premiere In Bed with Madonna, wearing a Jean-Paul Gaultier conical bra and short pants in dusk pink, you knew she was pushing the boundaries, but she got away with it. And that smiles says she knows it. We are fortunate to have a balcony adjacent to the carpet that we shoot from to get these beautiful bird's eye views. In this particular shot, the cast of Gus van Sant film The Sea of Trees look like they are standing in front of a conductor, adding to the theatre of the carpet. 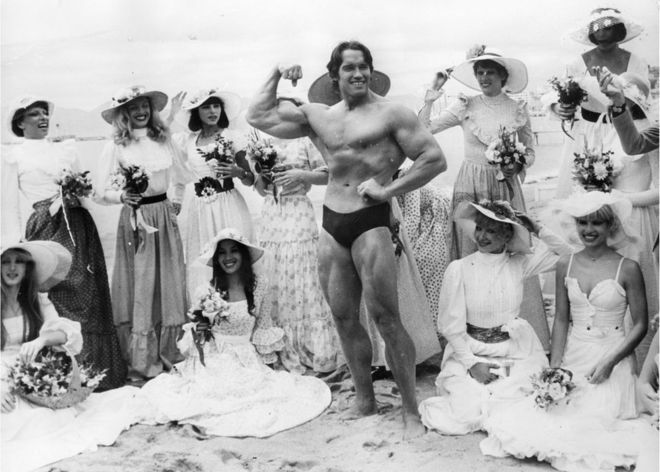 A young Arnold Schwarzenegger wore a pair of budgie smugglers on the beach and flexed his muscled body to thousands of people who showed up to his non-traditional photo call for the film Pumping Iron. This certainly was one of the more unconventional moments we have seen at the festival in its 70-year history. This image isn’t your usual beautiful red carpet moment. This was the first time Sean Penn and Charlize Theron had been photographed together in public since their shock split. They had been careful to walk as a group and separated by their cast mates, but right at the end, when most of the press had put their cameras down to pack up, Charlize reached out to Sean and kissed his cheek, at the top of the steps. Luckily, we caught the moment, proving a picture is worth a thousand words. In 1965, US actress Olivia De Havilland became the first woman to be appointed president of the jury, at the 18th Cannes Film Festival. 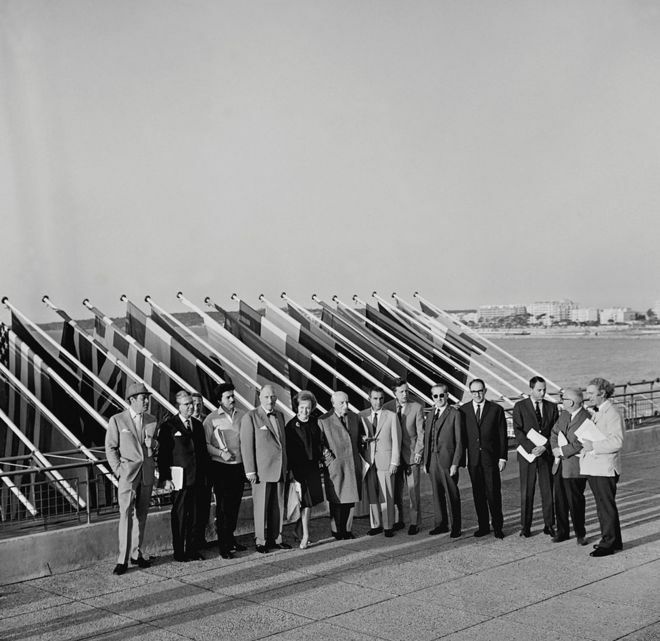 I love this image of the jury. There’s only one woman in the group, but she presided over them all. This iconic moment paved the way for many women in the film industry who followed after her.